Artist Elizabeth Tyler: Same, same but different. 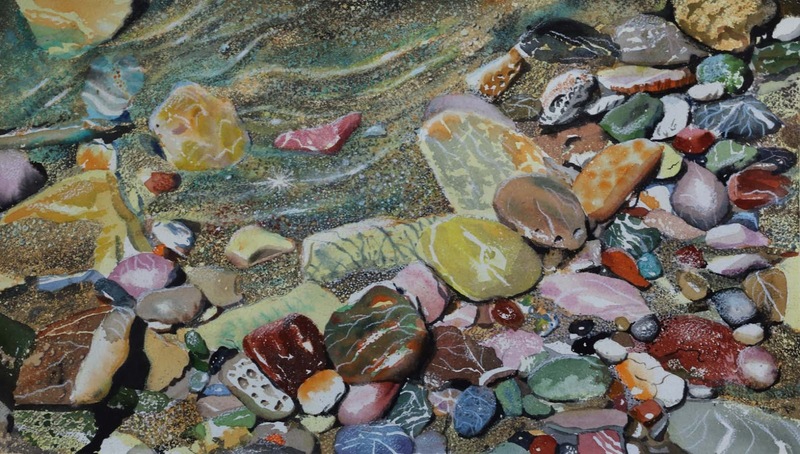 A pebble beach with multicoloured stones can be found anywhere in the world and it is a favourite subject I often return to. In Greece the water is so clear it's almost invisible, resulting in soggy, wet sandals when I'm walking along the waterline. It is of course right here the wet stones are at their best and most colourful. Many is the time when I have collected a few, only to be disappointed on getting home to find them dry, dull and non-descript. 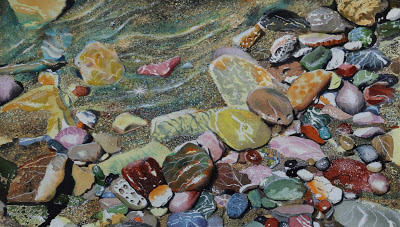 In this watercolour I wanted to show the enormous diversity of the pebbles and stones. Not only in colour but shapes and sizes, surface textures and markings. Even the sand under the ripples of water is not just yellow but has it's own special character and is after all a compromised collection of minute and microscopic pebbles with similar colours. Impressive! You have certainly captured the diversity of the rocks and their beauty when wet.